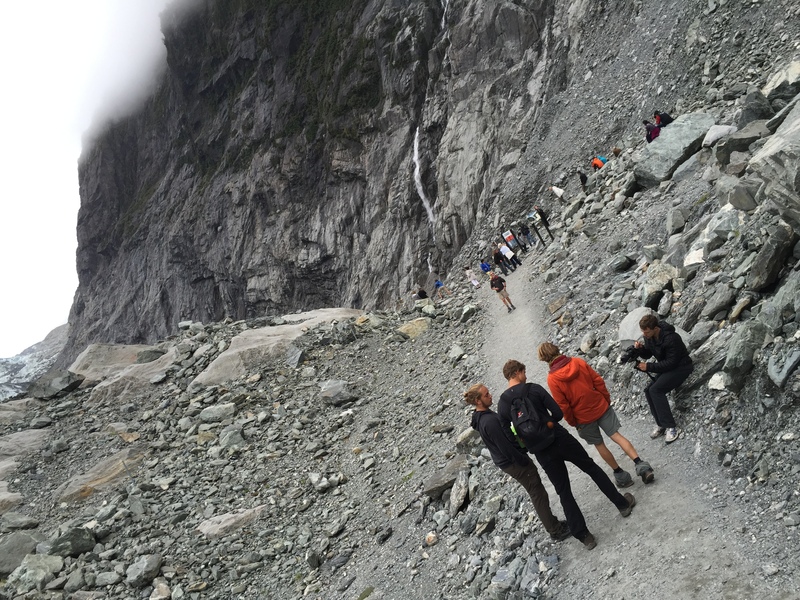 A visit to Fox and Franz Josef glaciers is a great way to chill out, literally. They are melting rapidly though, so head there sooner rather than later! A friend told me not to bother going if you can’t see them by helicopter, and although it’s truly the best way to view them, it’s still worth going even if you don’t go up in the sky. 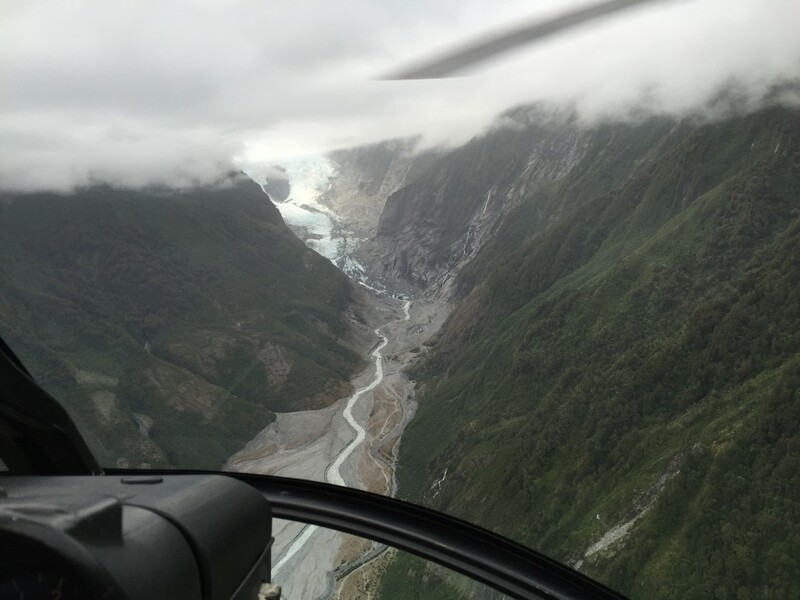 That being said, I did opt for a helicopter flight as one of my few special excursions in New Zealand. I’d planned to hike on them, lugged my wool beanie hat, long underwear, fleece, rain jacket and pants, and gloves in my small pack all through the summer of my trip so far in order to dress warmly to tramp on the ice, but found out that as of last year, you cannot hike on the glaciers unless you go up and do a multi-hour heli-hike or ice climbing trip, getting dropped off by helicopter. The cost of this was prohibitive for me (around $600-$800), but all was not lost. 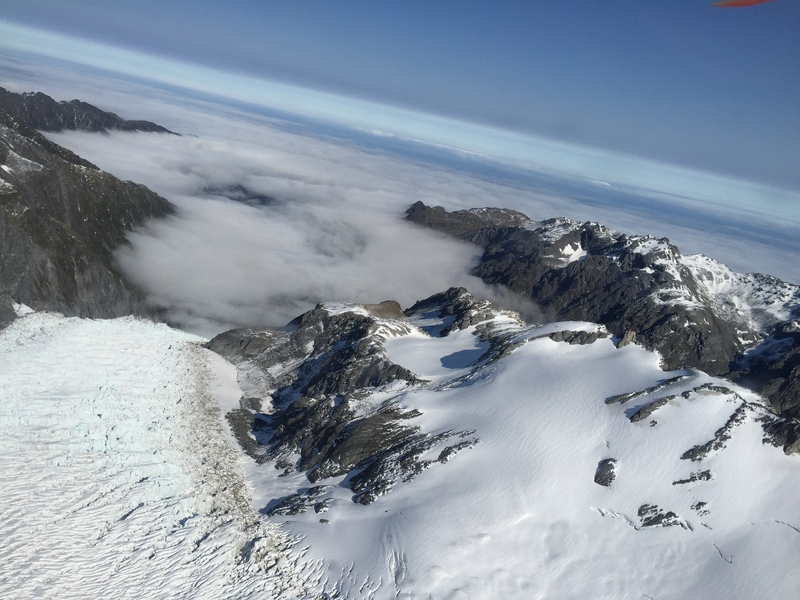 I did some checking around and found out I could do a 20 minute scenic tour over both Fox and Franz Josef glaciers for $195, and then went on my newly discovered discount site, bookme.co.nz, and that brought it down to $155. 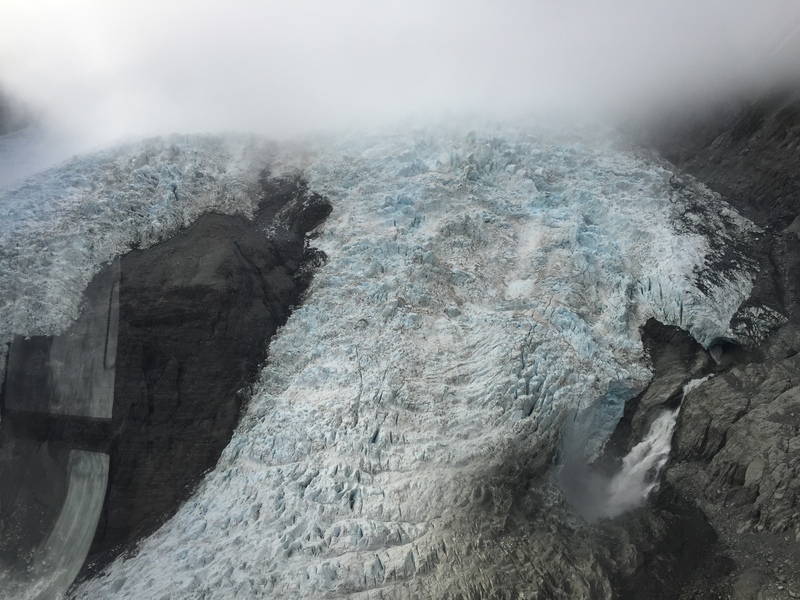 (More about that in an upcoming post “Budgets & Bargains.”) It turns out this was for the best, regardless of the price tag, as I found out later with the heli-hike trips you actually see less of the glaciers. 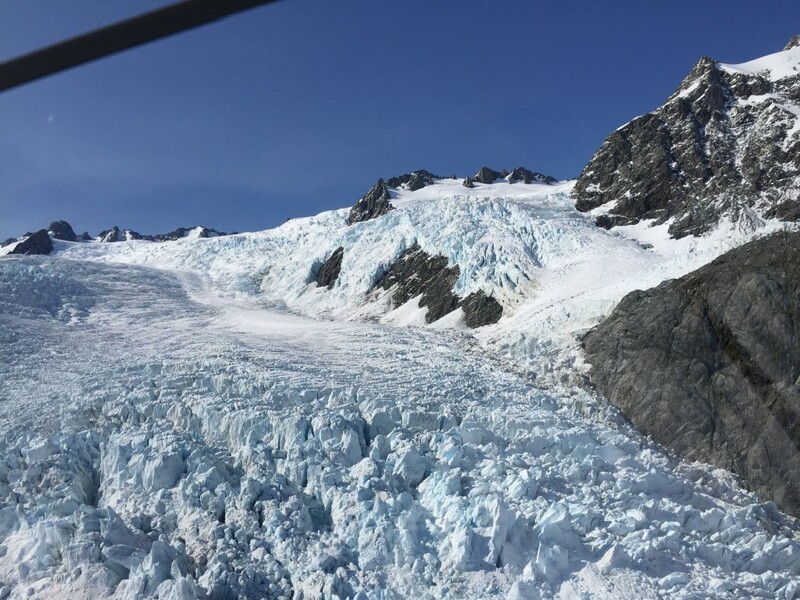 They take you up in a bigger, more utilitarian chopper for 5 minutes to drop you off, and the same in reverse, so you are ON the glacier, seeing it up close and personal, but don’t have the amazing views I had from up above in a helicopter that was mostly window. And living in Michigan most of my life, I’ve seen plenty of snow and ice up close. 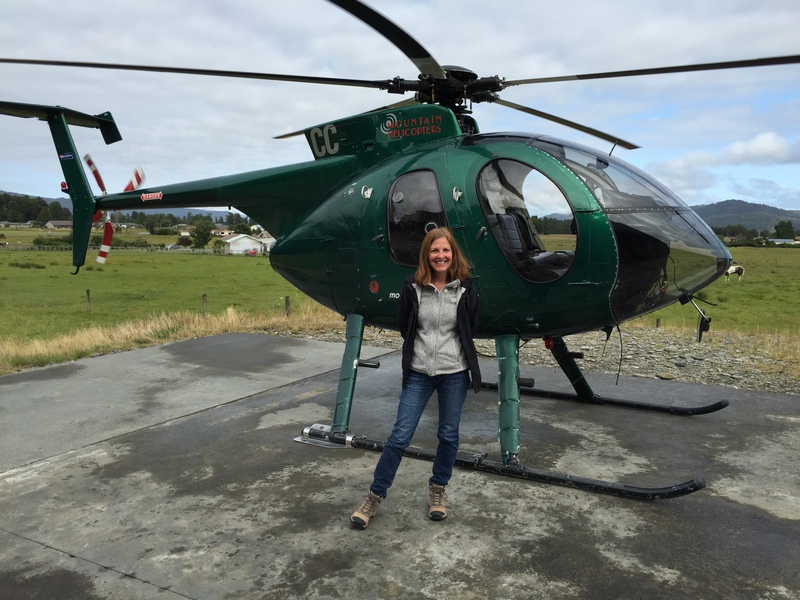 I was up early and thankful for the lack of rain – it rains a lot there so many helicopter trips get cancelled. They weighed me and 3 young German girls, and told us no purses, backpacks or bags are allowed. 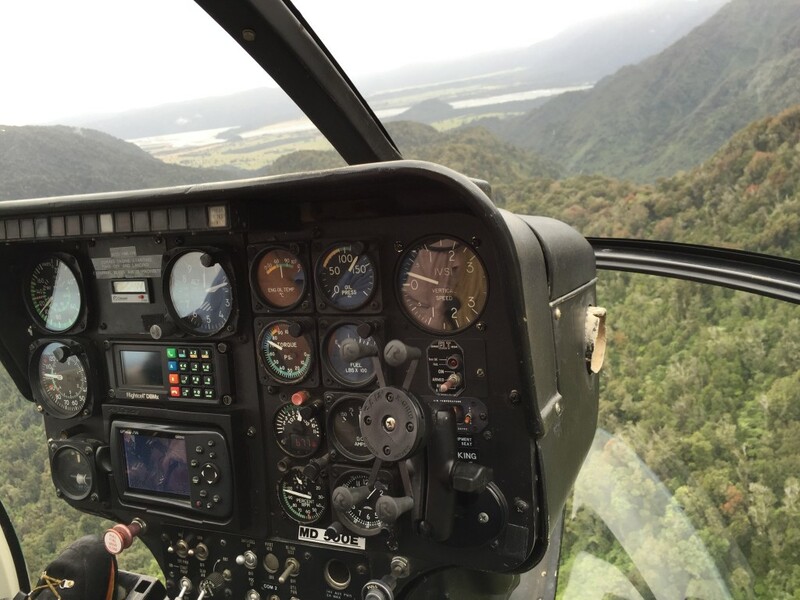 I saw why when we got to the helicopter – it was a little green bug of a machine, and I wondered how we’d all fit. 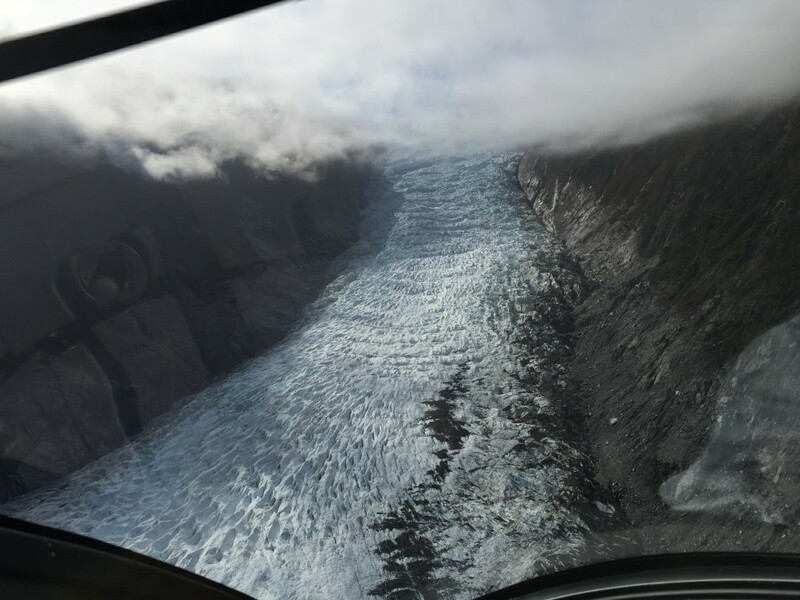 It was gray and cloudy but when we lifted off the ground, we were below the clouds as we hovered and soared over the glaciers – I thought it might be a little scary, but it was exhilarating! We donned our head sets to block out the chopper noise and so we could hear the pilot’s narration. At first, we saw the forest, like a furry green carpet, and then the craggy rocks and bumpy blue white glacier. Suddenly, the pilot said, “I see a hole up there!” and we shot up through the one small blue opening in the otherwise gray clouds. 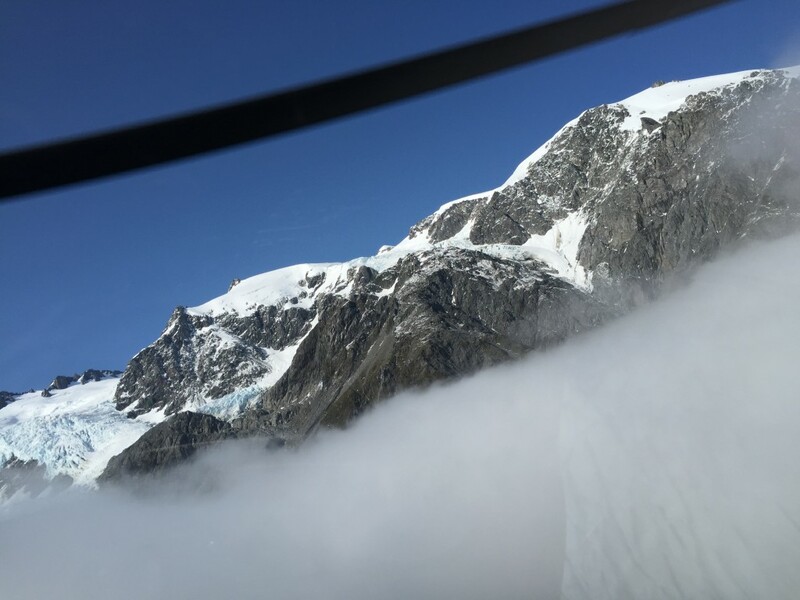 Now we were above the clouds, surrounded by blue sky and sunshine, with a view of snow-capped Mt. Cook in the distance. 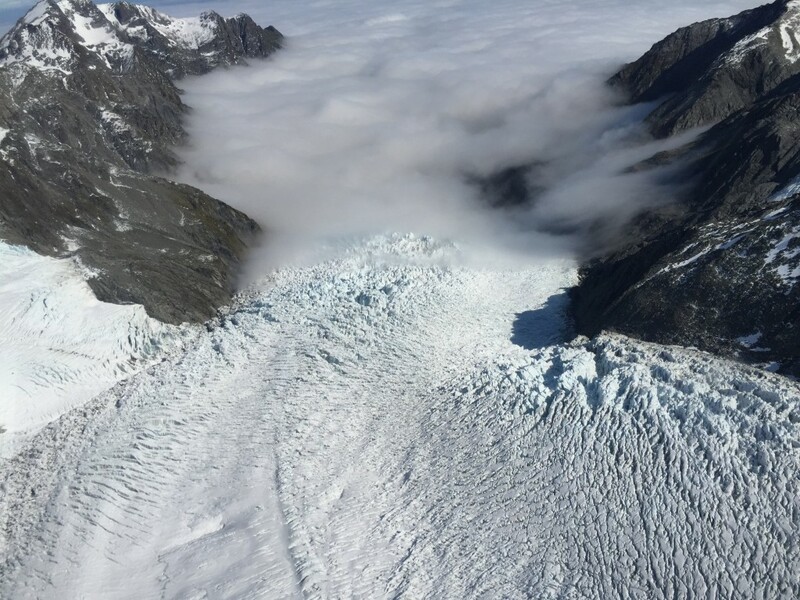 We flew over both Fox and Franz Josef glaciers, as well as a couple of others I don’t remember the names of. 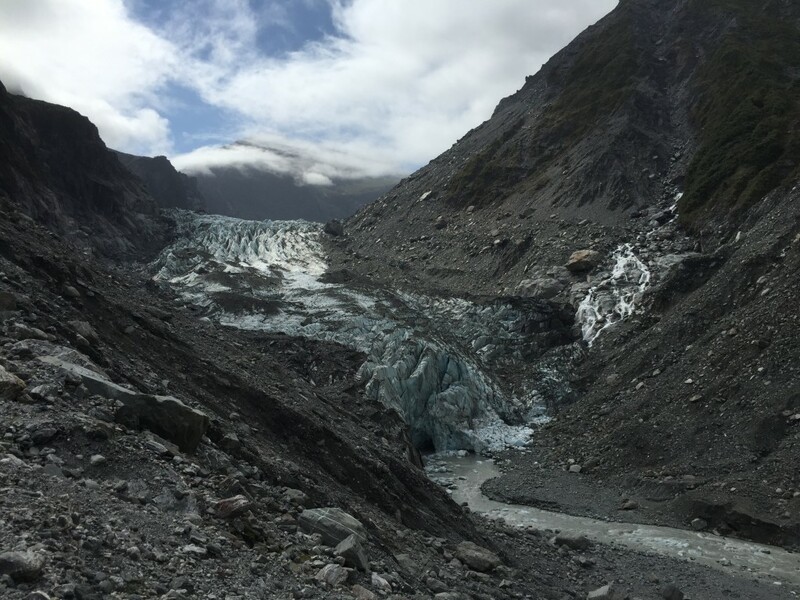 You can debate climate change, but there’s no denying the glaciers have receded greatly in the last couple of decades. 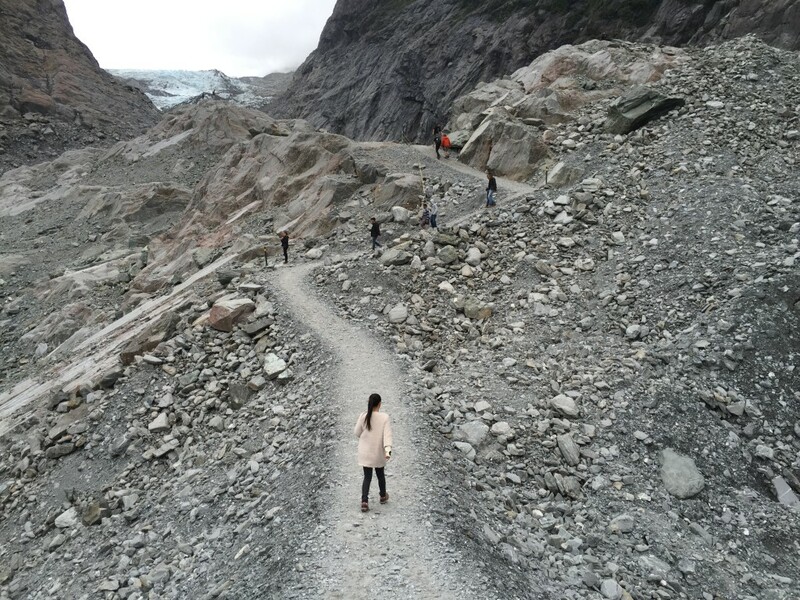 We saw not only the glaciers and mountains, but rivers, waterfalls, and a tiny pair of hikers outside a mountaintop alpine hut, and then we were back on the ground much too soon. 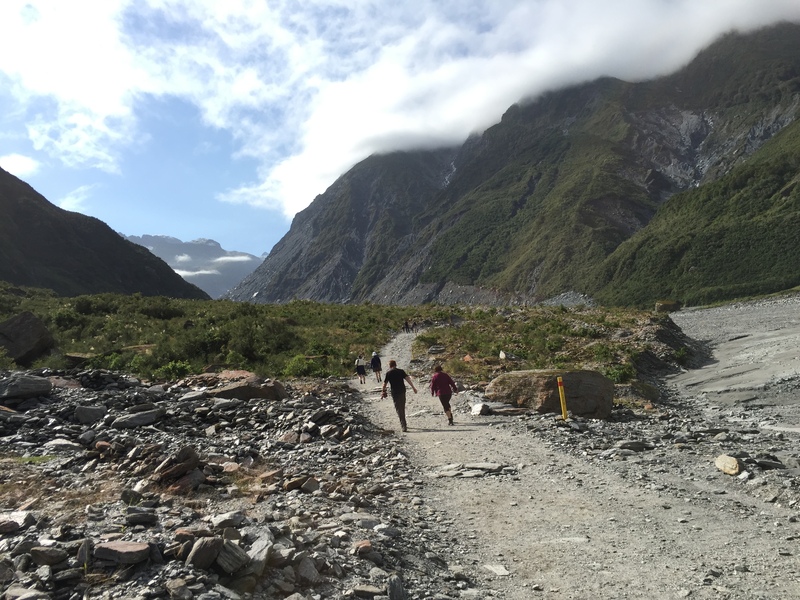 After that, I headed to the trailhead for Fox Glacier – you are only allowed to hike up to where the terminal is (the place where the glacier ends). 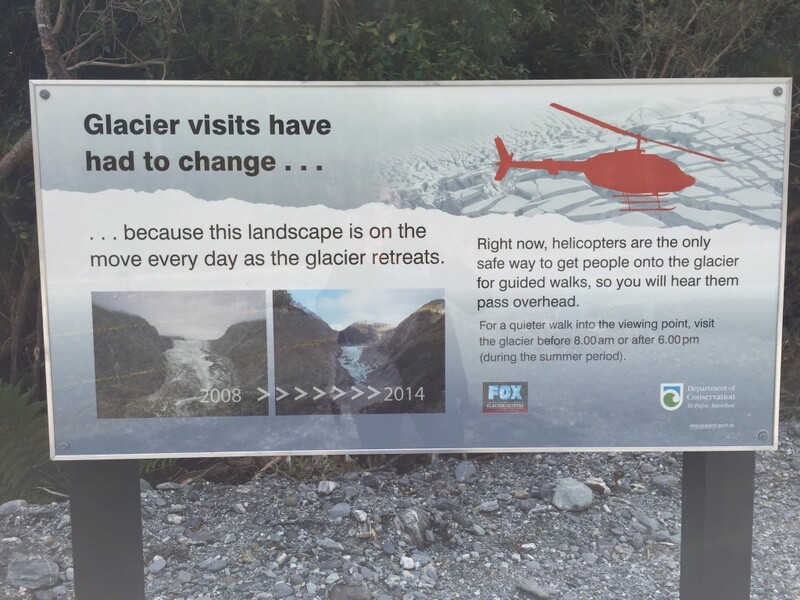 This is apparently because a couple of tourists died a few years ago when some ice fell. 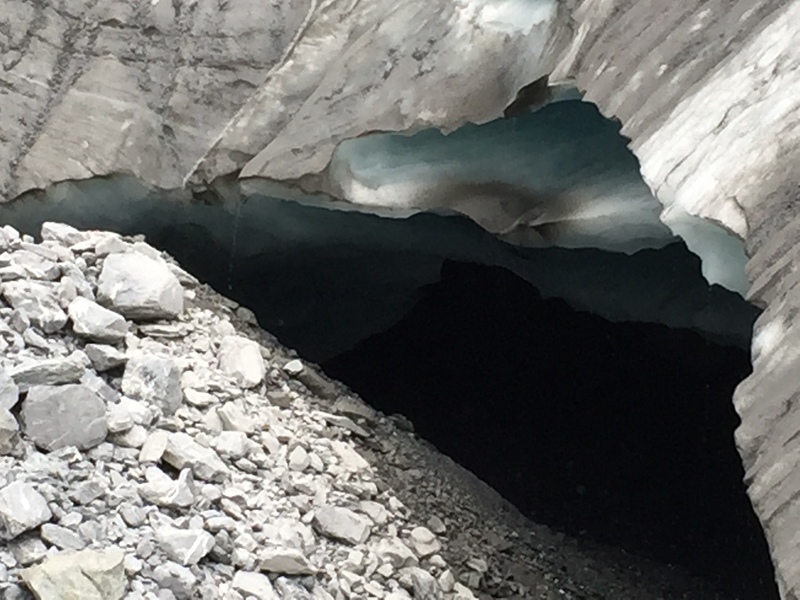 The glaciers are highly unstable, and rocks and pieces of ice the size of camper vans fall regularly. It was about an hour and a half hike, up a rocky trail with places where you had to hop from stone to stone to cross several streams of water. From there, I took a walk around a pretty little lake called Matheson, which is known for it’s mirror-like reflections, but unfortunately only on clear days with no wind, and the weather did not cooperate. 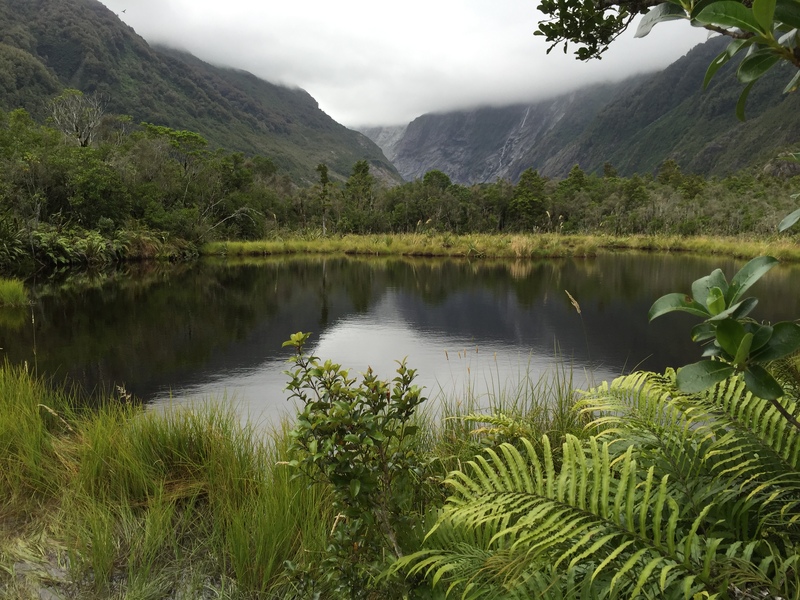 Still, the easy hike through rainforest gave me a very scenic spot to eat my sack lunch. 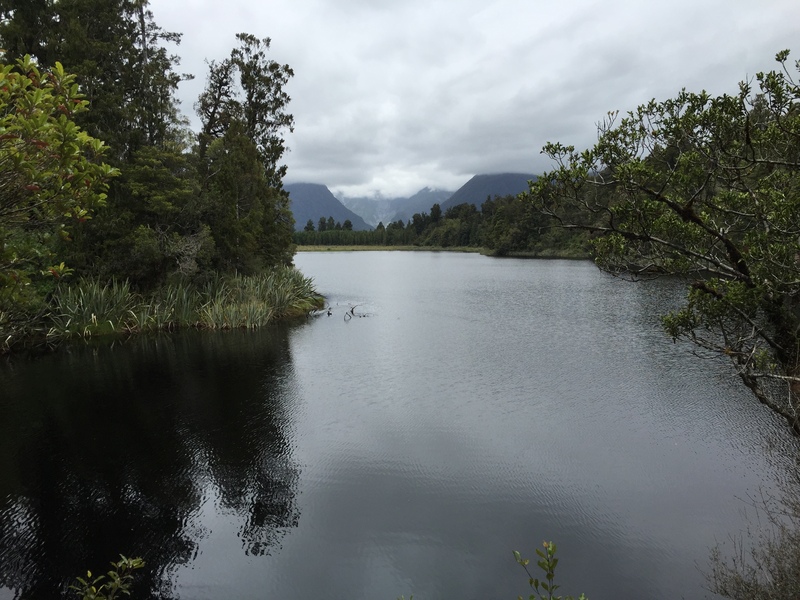 It’s 22km of winding mountain road up to Franz Josef from Fox, but I had time, so I headed that way and did the hike to the terminal there as well, another hour and a half tramp through country that looked like Lord of the Rings, where the dragon Smaug might appear any second. This rocky winding path climbed along a rushing river with giant waterfalls, and the clouds had really moved in, making for a moody scene. 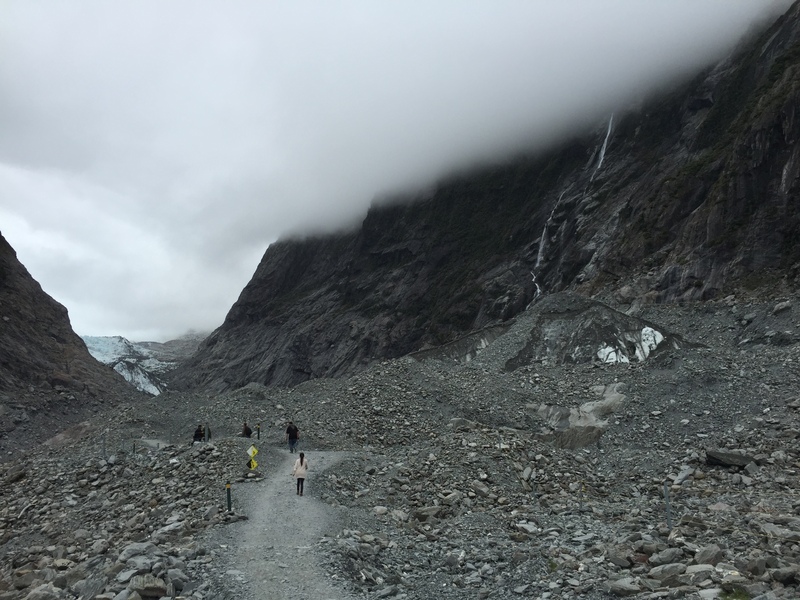 Stunning views awaited up at the top looking back down, along with an ice cave where blue-white ice hung thickly over a deep dark opening, and there was a view of what looked like a river of ice streaming down to meet us. Back down near the parking lot, a short trail took you to Peter’s Pool, where the small lake did display some reflections for me, and I had the place all to myself to reflect for a bit. 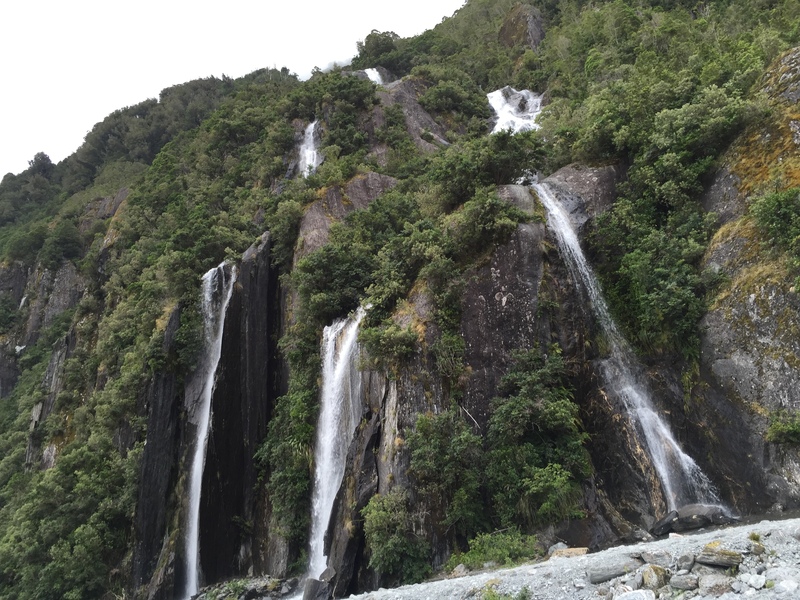 After all of that climbing (4 hikes in one day, plus the helicopter flight) I was starving, so I stopped in Franz Josef for an appetizer of chicken satay, a cold beer, and some interesting conversation with a young French backpacker and a retired commercial pilot from Park City, Utah who was on a bike trek. 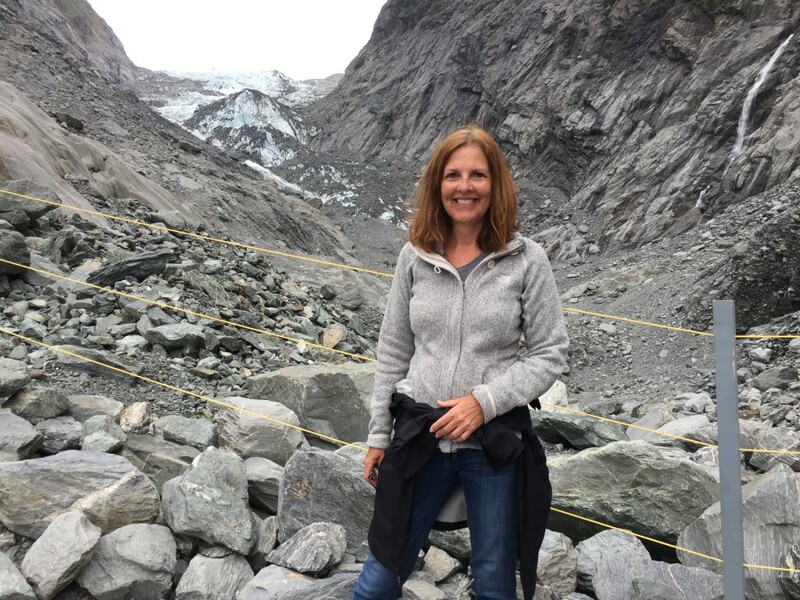 You meet so many nice people when you travel, especially solo. 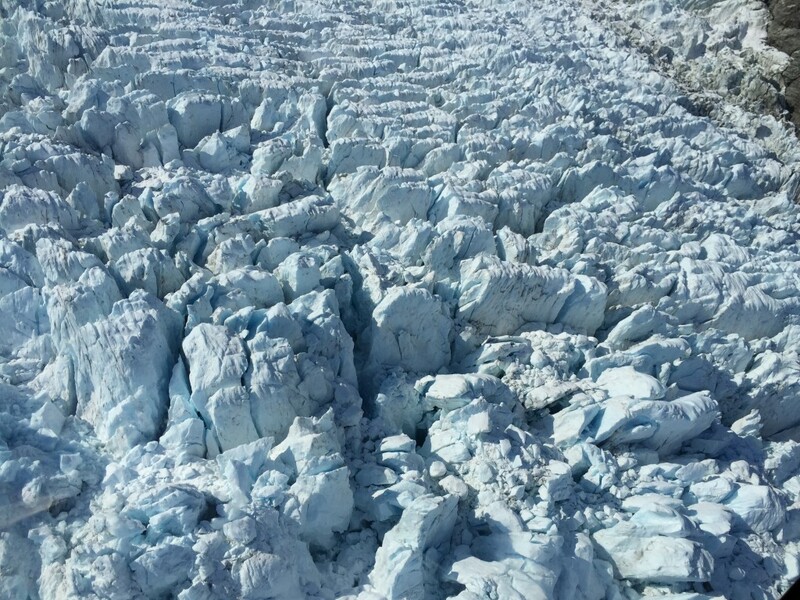 To sum it up, it’s definitely worth a journey to the glaciers, and especially a helicopter flight if you can swing it! Thanks for this view of an amazing place I will never see myself. 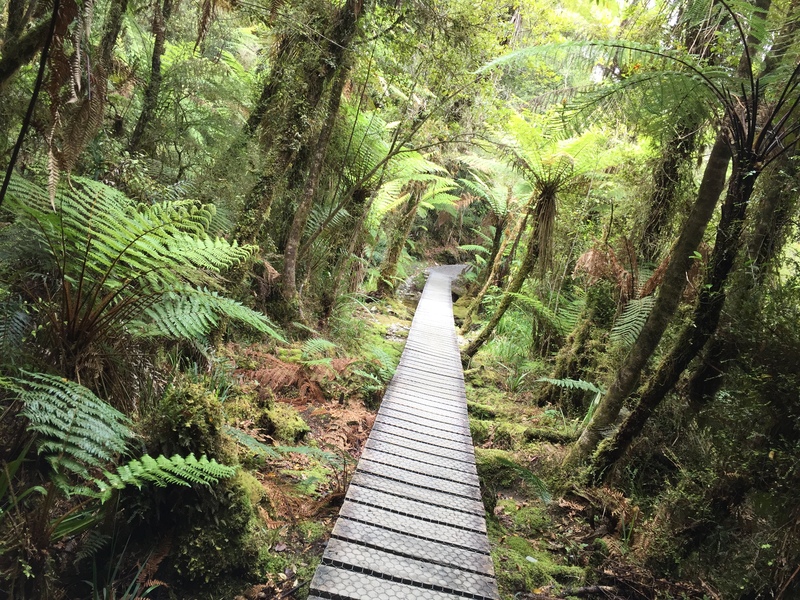 Your post are inspiring, but NZ is too far for my travelin’ shoes!